After decades of painting South Jersey homes with conventional products, more and more local contractors are now switching to "greener" paints. It's because NJ house painters finally have enough affordable and easily accessible options to be environmentally conscious without sacrificing the longevity, quality or aesthetics of a paint job. Chances are, you already know that the air inside your home can be 5 to 10 times worse than outdoor air pollution, even if you live near a busy road. And although the contamination cannot be blamed on any one single source, the interior paint you use plays a significant role in the problem. Many mass produced paints contain solvents, toxic metals and volatile organic compounds (VOCs), that contribute to poor indoor air quality. You can smell these unhealthy fumes in a freshly painted room, but what you can't smell is the off-gas release that can continue for up to 5 years from all painted surfaces. VOCs in conventional paints are harmful gases with a number of short- and long-term adverse health effects, such as respiratory and metabolic illnesses, headaches and allergies, and a host of other acute and chronic disorders. Young children, elderly or chemically sensitive people are particularly susceptible to these gases. So if indoor air quality and your family's health are important to you, consider the following "greener" alternatives for interior painting. 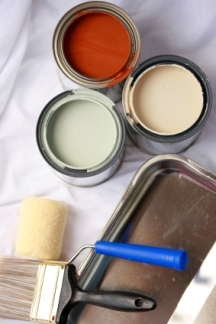 South Jersey doesn't have a lack of "green" options, and your painting contractor or paint store staff should be able to recommend the best one for your particular project and/or health situation. Many people have heard about the health dangers of VOCs, but not many realize that not all VOCs are manmade, and that some are actually released from nature. In fact, over 50% of VOCs produced in South Jersey (and the rest of the East Coast) are made by trees! Natural VOCs, or terpenes, are a result of resins and pungent oils of some trees (pine, oak, citrus, etc), as well as aromatic plants and even insects. That means we are always exposed to VOCs in the air and cannot avoid them completely. So why all this fuss about low and zero-VOC paints then? It's because natural VOCs are not as toxic to health as those released by manmade ingredients. Most people don't have any adverse reaction to terpenes, and in fact, even enjoy them (natural terpenes usually smell very nice). They pose a problem only for sensitive people, and the most typical reaction (if it happens) is a temporary irritation of mucus membranes. But synthetic VOCs are more sensitizing and harmful to health even in small amounts, and they are often the "last straw" that can push you over the sensitivity threshold. Synthetic VOCs are added to a paint's base at the formulation stage, and then again during the tinting process. So VOCs mostly come from the solvents and pigments in paint. That is why oil-based paints usually contain more VOCs than water based paints (water is the solvent in water borne products). 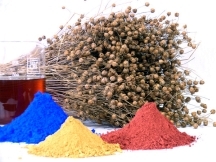 And since pigments used to color products also release VOCs, usually the deeper the color, the more VOCs the paint emits. In addition, paints usually contain fungicides and biocides (to prevent bacteria, mold and mildew growth), preservatives, hardeners, adhesives, drying accelerators and other ingredients that are released in the air while and long after you paint. 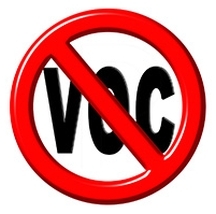 The most important thing to understand about VOC regulations is that their goal was to help reduce outdoor VOC emissions (which can contribute to the formation of toxic ground level ozone and smog). In other words, they were not developed for the purpose of reducing indoor VOC emissions, or for minimizing the chemical exposure to building occupants! What this means is that since not all VOCs contribute to the formation of ground ozone and smog, low-VOC and even no-VOC paints may still contain some toxic to health VOCs that can off-gas into the indoor air. Also, some VOCs are more harmful than others, so the total number of VOCs in a paint may not be an accurate representation of their impact on your health. Besides, the amount of VOCs a paint contains does not always equal how much gets released into your home's air - testing has shown that sometimes paints with fewer VOCs produced more VOC emissions, and vice versa. And finally, you need to realize that the VOC regulations cover only VOCs in the bases, but as you now know pigments (which are added to all bases, even to white paints), also contain VOCs. So the paint you actually bring home will usually have a higher amount of VOCs than what's stated on the can. All this inconsistency is due to the fact that we are still in the early stages of "green" consciousness, and the VOC research is far from complete. Testing for VOCs in paints is difficult and not always consistent - the results often depend on the method used. So in the meantime, just do the best you can and don't lose sleep over it. After all, stress is bad for your health, too! Note that the term "non-toxic" is used here in its broadest sense, because with paints it's more a matter of degree - even zero-VOC products contain some small amounts of toxins. So no matter whether you use natural, zero- or low-VOC paint, it’s still best to keep the room well-ventilated. 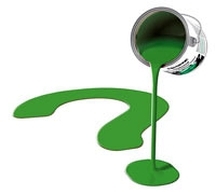 Until recently, VOCs were essential to the performance of paint, and the "green" alternatives used to be hard to spread, looked blotchy and didn't last as long. These days, many eco-friendly paints already rival conventional coatings, and the formulations are getting better and better every year. In terms of price difference, the situation is getting better as well - the greener options are starting to cost about as much as regular paints, but even if more expensive, the price is no longer prohibitive. And some companies are even going beyond the formulation: they may use containers and labels made of 100% recycled materials, print with soy ink, or ship their products using biodiesel-fueled vehicles. 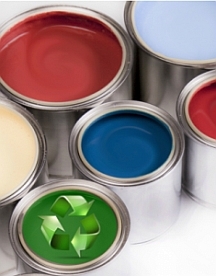 A "low-VOC" claim simply means that the paint meets Environmental Protection Agency’s minimum requirements, which allow no more than 250 grams per liter of VOCs in latex paints, and no more than 380g/l in oil-based paints. So anything lower than 250g/l can be marketed as low-VOC, "green" or environmentally friendly, although most reputable brands try to keep their low-VOCs under 50g/l (pre-additives). Low-VOC paints usually emit little to no odor, and the higher the amount of VOCs in the product, the more you can smell them. 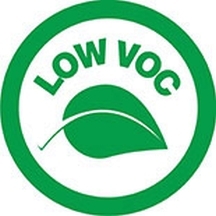 But a "low odor" label does not mean that the product is low-VOC (unless specifically stated), because not all VOCs can be detected by the human nose. Zero-VOC paints contain under 5g/l of VOCs and again, this is before tinting. However, more paint manufacturers are beginning to use waterborne colorants that have zero VOCs, so the product remains low- or zero-VOC even after tinting. Natural paints (which may also be marketed as containing organic or food-grade ingredients) are usually milk, soy, or clay based. However, even among the makers of such "natural" paints, there is no agreement about what exactly that label means. Some of them use low amounts of synthetic and petrochemical ingredients, while others stick to exclusively natural ones. But those in the "all-natural" camp may use animal products in their bases, or titanium dioxide as a whitener (which is a big problem for the environment). So it's obvious that there are various degrees of "natural", and the only way to see the whole picture and make an informed choice is to read the product's label and its MSDS (Material Safety Data Sheet - which you can usually find on the manufacturer's website, or at the store). Also, it's worth noting that even those products made from "100% natural" materials, still contain some VOCs, albeit natural ones - terpenes (the stuff that comes from tree oils and resins that are used in natural formulations). As was discussed earlier, terpenes are what make natural paints smell nice and citrus-ey and are usually not problematic to health (except for the most sensitive people). Still, from the manufacturing process to the landfill, natural paints are gentler on the environment and produce a much lower impact on your health (if any). They are usually made without carcinogens, formaldehyde, phthalates or toxic biocides, and are a perfect choice for elderly and sick people, pregnant women, nurseries and kids' rooms. While some of the chemicals in conventional paints cause health problems, others damage the ozone layer, pollute the air and water, and add to many other environmental issues that sooner or later still affect our health. 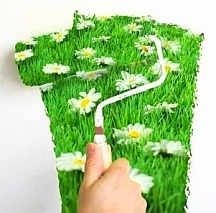 So it's only logical to extend your "green painting" efforts outside your home, too. And even though exterior paints are much harder to make truly eco-friendly (because they have to withstand harsher conditions than interior products), you can still make better choices. Where possible, avoid oil-based products (which have high VOCs) and use latex and acrylic paints with low- to zero-VOCs. But even if you have to use regular paint, you can still minimize the impact on the environment by choosing the best, top-quality coating for your project - it will usually need fewer coats, and last much longer between reapplications. As far as exterior staining goes, clear/transparent stains contain a higher amount of toxic chemicals than darker stains or paint. However, you can now find "greener" options even among wood finishes, primers and paint strippers. And finally, don't forget about paint disposal - how you get rid of the product leftovers makes a difference, too. These days we have no more excuses when it comes to eco-friendly house painting. South Jersey is now all set to fully join the "Green Wave"!